GIGA GRANADA HILLS: ...especially when she sits on his head. ...especially when she sits on his head. Sounds like dialog from a cheezy martial arts movie. 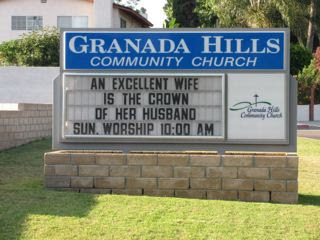 GH is the land of a thousand churches, each with it's own astonishingly stupid sign out front. Ummm, it's in the Bible people. That doesn't prevent it from sounding goofy.